This blog contains articles about recent events related to Polarion as well as technical discussions and solutions. Polarion (https://www.polarion.com/) is a unified platform for Requirements, Quality and Application Lifecycle Management (ALM). Audience: 25 people + watching online. Audience: 50 people + watching online. 13:15-14:00 Polarion Customization at Vorwerk (presented in 2016 at PLM-Europe). ideas for the new projects – What we would do different/better. The event is organized by GARANTIS IT Solutions Ltd. and BSUIR, department of Computer Systems and Networks. This seminar was a good chance for students of BSUIR university to learn about Requirements Managements in modern Internet-of-Things (IoT) projects. Polarion ALM was presented as a universal Application Lifecycle Management (ALM) solution, which allows powerful requirements management using workitems, links, documents and reports. The seminar was presented in Russian language in BSUIR, city of Minsk, Belarus. Duration: 2 hours. Belarusian State University of Informatics and Radioelectronics (BSUIR) - is the leading technical university in Belarus. It provides state-of-the-art study programmes in IT, radio electronics, infocommunications and digital economy. The eductaion in BSUIR is and intencified mix of mathematics, phisics and comuter science subjects. Graduates of BSUIR are working around the world in leading software companies. They also work in local Belarus silicon valley, famous by such world-known companies as Viber.com, EPAM.com, Wargaming.net. 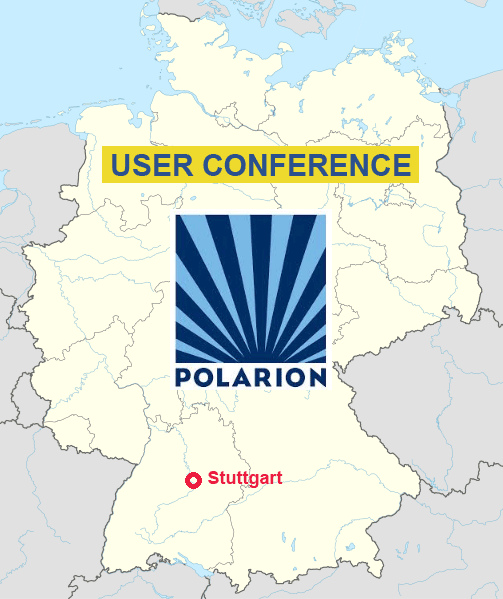 The event is organized by Polarion User Group. This meeting of Polarion Users and representatives of Siemens is a good chance to learn about new features of Polarion and to exchange technichal information. The meeting started at 15:00 and finished at 19:00. You could take part in the meeting by visiting ASK office or remotely via Skype/Phone. The event is organized by Siemens. GARANTIS IT Solutions is planning to attend this event and make presentation about managing Feature-Driven-Development projects in Polarion. 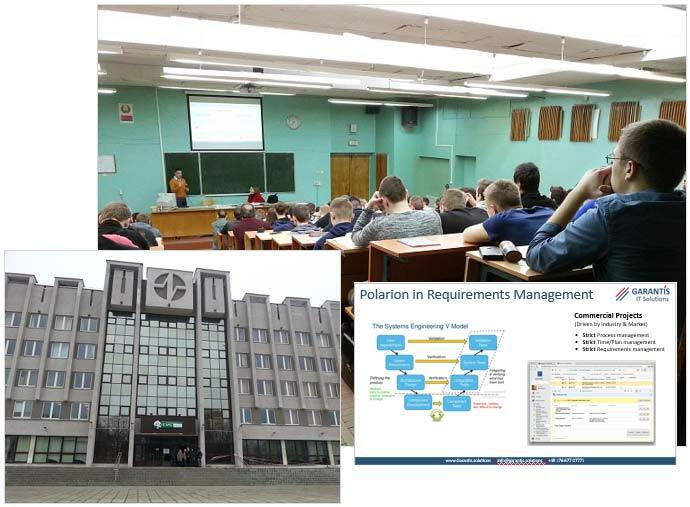 The half day workshop "Requirements Management, Test Management, Unified Application Lifecycle" gave an overview of Polarion capabilities, including hands-on experience of using Polarion. Participants had a chance to work with Work Items, Links and basic Reports. Howerver half a day is not enough to demonstrate all functionality of Polarion and to go into deep discussions of Process (high level) or Specific Functions (low level). Therefore it is recomended to watch online videos for each topic or ask for additional Demo/Pilot project to get deep understanding of the Polarion ALM tool. The event took place in Stuttgart on 13 October 2015, with about 200 participants. 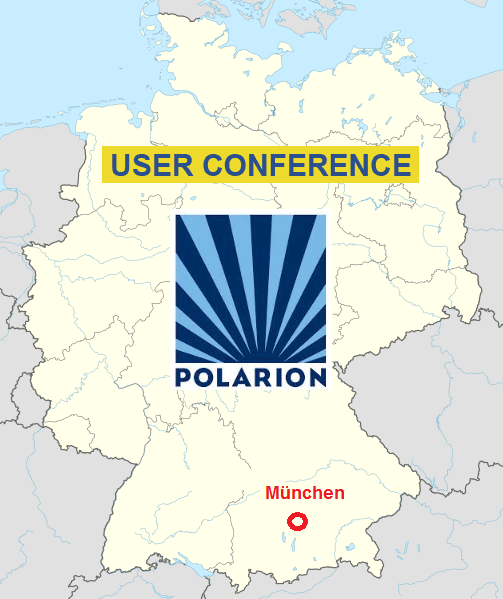 It was the 5th Polarion User Conference. The Agenda included speaches by many Polarion partners, as well as interesting insight presentations by Polarion speakers, such as Jiri Walek, VP Product Management and Nikolay Entin, VP Research & Development. - Parametrization of Test Cases in Polarion. It will allow to reuse test scenarios. All presentations could be grouped by topics listed below. by Jiri Walek from Polarion Software, "Solution speech: Polarion Approach on Quality Assurance"
by Jiri Walek from Polarion Software, "Polarion 2016 Preview and Early Access"
by Michael Azoff from Ovum, "Keynote: ALM-PLM Integration with Software-Rich Engineering"
Defect Rate, Progress on Budget, etc). by Dale Gillibrand from Siemens UK, "EARS - Easy Approach to Requirements Specification"
Covered topics of "How to define and write requirements". EARS stands for Easy Approach to Requirements Syntax. It describes what the system shall do as a black box. What it shall do at the identified boundary of the system. - 1 is used to capture optional features. by Stefano Rizzo from Polarion Software, "Iot & Industry 4.0 Predictions"
by Matthias Stursberg from Vaillant GmbH, "Polarion along the mechatronic V-Model to improve function development"
by Fabien Grellier from PagesJaunes, "Release accelearation by combining Agility, Requirements and Continouos Delivery"